Each year since 1978 state lawmakers have been asked to update the state income tax laws with the changes made to the federal income tax Code during the previous year. This act of conforming to the changes to the federal law is done to minimize the differences between the federal and state law but only with respect to what defines taxable income. Note well that while the state law only adopts federal income tax provisions which define income such as what is taxable income, what expenses can be deducted, and how income is treated for tax purposes, the state law does not pick federal tax rates or brackets nor does it adopt federal tax credits. A herculean effort was undertaken in the mid-1970’s to bring the state income tax law into line with the federal law because taxpayers, as well as the well-informed tax practitioners, had a difficult time figuring out if the state law treated different types of income in the same way as the federal law. This was often difficult to determine because the way state law used to pick up federal changes to the income tax Code was to adopt the Public Law that made the change. Public Law is the result of a piece of legislation passed by Congress and is signed into law. It may pick up perhaps just a paragraph of the tax Code to make the change. Over the years, what happened is that unless a taxpayer had access to old public laws, reading the state statute told him or her absolutely nothing except so and so Public Law was operative for state income tax purposes. This made administering and complying with the state law difficult, if not impossible. The other thing that happened was that when changes were made to the federal Code that resulted in a loss of tax revenues, state lawmakers would avoid adopting that change because they didn’t want to lose state tax revenues. 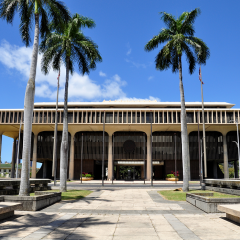 All that changed in 1977 when a team of legislative researchers threw up their hands and decided to find a way that would make it easy to determine whether or not a provision of the federal income tax Code was operative for Hawaii. Out of that was born the state conformity statute which adopts the Code by exception. In other words, the law pronounces that the federal law — Subtitle A of Chapter 1 as of a certain date (like December 31, 2000) shall be operative for state income tax purposes except for the following list of provisions. For the taxpayer, all he or she has to do is look down that list and check to see if the provision of the federal Code that is being applied is in that list. If it is not in the list, then the taxpayer knows for sure that the federal provision applies under the state income tax law. In adopting that statute, lawmakers pledge their intent to annually update the conformity statute so that taxpayers would know with certainty which federal provisions worked for the state income tax. They also agreed that no matter what the financial impact of adopting the federal provisions would be for state finances, it was more important to keep the difference between the two laws at a minimum. And there are some significant differences. For example, the federal law taxes pension income and the state law does not. Under the federal law, cost-of-living allowances are exempt but they are taxable under state law. This year, the conformity issue will present a challenge to lawmakers as well as to administration officials and there are many provisions in the recent “Economic Growth and Tax Relief Reconciliation Act of 2001” that will cause a reduction in tax revenues. For example, under the new law expenses for higher education will be deductible. And while the impact of the educational IRA’s and increases in contribution limits to Roth IRA’s won’t show up for years because it is the accrued earnings that will escape taxation, the increased contribution limits to traditional IRA’s will. With the state’s finances in the tank as a result of the downgrade in revenue forecasts, lawmakers and administration officials may be tempted not to pick up these changes. That would be unfortunate for taxpayers as what will be required for the federal income tax may not be required for the state tax. This is particularly true with respect to provisions relating to employee retirement plans where changes today will affect future benefits for retirees. Fiscal stress or not, lawmakers should respect the pledge made many years ago to taxpayers to keep the differences between the federal and state income tax laws to a minimum regardless of the financial impact. Not only would keeping the faith to conformity benefit taxpayers, but it will also benefit tax administrators. How Do You Improve The Business Climate And The Economy? Keep the Estate Tax or Dump It?